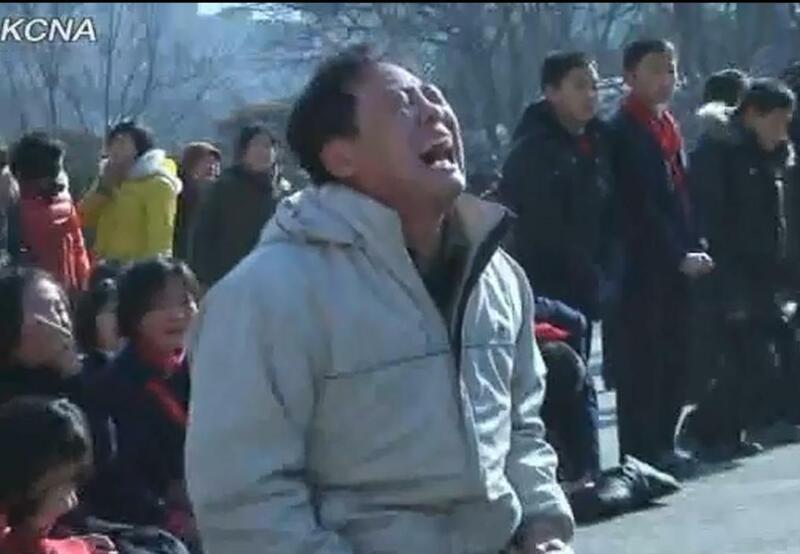 I’ve been thinking all week about the hysterical sobbing in those images of North Koreans mourning Kim Jong-il. Was it group hysteria? Was it pretend-crying just to avoid looking different to everyone else? Was it stage-managed or was it genuine for a leader who was a daily presence? Maybe it was grief for loved ones dead in famines or just their own miserable luck to live in such an accursed place? Was it fear that things could get worse under Kim Jong-un? Was it simply just a great chance to cry uncontrollably and not look out of place? Whatever it was, the ambiguities in the tears have defined North Korea since the end of World War II. When the Democratic People’s Republic of Korea began in the northern part of the peninsula in 1946 it was faced with two big problems. The North had always been more remote and less developed and two million more fled south to avoid the Communist DPRK. The three-year war that followed left the new country in tatters. North Korea became a centrally planned economy which strangled small business. Dissent was not tolerated and all good was embodied in leader Kim Il-sung. Il-Sung promoted “Juche” as a concept of self-reliance to make do in difficult times. He said Juche meant man was the master of everything and decided everything. That man was him and he mobilised the entire workforce to industrialise North Korea rapidly after the civil war. Suspicious of the South, they built up their military might to deter invasion. They ran up massive debts to the USSR, China and Japan. By 1980 they defaulted on loans and the economy has been contracting ever since. The collapse of Soviet Communism left Russia unimpressed with its poverty-stricken debtor. DPRK increasingly relied on China as its only open border. Il-sung refused to consider Gorbachev’s perestroika because he knew it led to glasnost. He died in 1994 and first son and heir apparent Kim Jong-il took over. Born in 1942, Jong-il spent his first years in Siberia with his parents. His father commanded the 1st battalion of the 88th Brigade, a Red Army unit of Chinese and Korean exiles. Jong-il was born in Vyatskoye, a fishing village near Khabarovsk where the railway turns south to Vladivostok. As a schoolboy, Jong-il was interested in politics and Marxist literature. He learned English in Malta and in 1980, was effectively head of the politburo with only his father above him. He inherited his father’s personality cult and was named head of the armed forces in 1991. With Jong-il making all the decisions since they defaulted on their debts, North Korea’s economy collapsed. When Il-Sung finally collapsed in 1994 aged 82, Jong-il was undisputed leader. The US were worried by his nuclear ambitions and threats to leave the Nuclear Non Proliferation Treaty. The countries signed an Agreed Framework as one of Jong-il’s first achievements in office. It allowed the DPRK to continue developing nuclear technology at foreign expense but with light water reactors rather than the nuclear proliferating graphite reactors they already had. The US overplayed its hand. President Clinton rashly assumed North Korea was on the verge of collapse. Congress would not pass a bill to end the trade embargo in place since the Korean War and the US dragged its feet in calling for tenders to build the new reactors. By October 2002, the US believed North Korea had an enrichment program and confronted them with their evidence. Three months later North Korea left the NNPT. The subsequent Six Party talks were fruitless. North Korea had gone rogue. While nuclear testing proceeded with Iranian and Pakistani know-how, the fate of the North Korean people worsened. Jong-il oversaw a collapse in industry and technology while floods and storms in 1995 wrecked electricity and health infrastructure and destroyed harvests. Hungry peasants ate what undeveloped crops survived and the country could no longer feed itself. Women and children bore the brunt of the death toll of a million or more in three years. Food from China, South Korea and the US eased the situation until Jong-il refused overseas aid in 2002. Inclusion in Bush’s 2002 State of the Union “Axis of Evil” heightened North Korea’s isolation. Famine conditions worsened again. Escapees told the BBC starvation was common with homeless people dying in railway stations, and others too weak to beg. Complaining about this would lead to instant imprisonment. Imagine the logical leaps of doublethink North Koreans must take in order to make sense of their world. Death is all around them but so is a regime that demands obedience and Juche. Even when people were confronted by evidence of the regime’s failures, their total reliance on state media meant foreign powers and the evil South were made scapegoats. The scenes in Pyongyang after Jong-il’s death are not without precedent. The public lamentation resembles the carefully choreographed mourning after Kim Il-sung died. Life seemed almost too unbearable to go on without Dear Leader. But just as in 1994, the state machinery will swing into action after a decent interval and the leadership cult will shift to Kim Jong-un. The world should learn from Clinton’s mistake. North Korea can survive despite dysfunction. Bellies may remain empty but the belicose dynasty of Dear Leader will continue. As the handpicked factory worker in the sobbing video said “I will change sorrow into strength and remain faithful to Comrade Kim Jong-un.” It’s best North Koreans cry now because it will not be tolerated in six months time. In mid 18th century an oddity was born in Ireland who if he lived 200 years later would have been Irish basketball’s great hope. In a dwarfish country stunted by lack of access to nutrition, Charles Byrne stood out. He was believed to be over eight feet tall though skeletal evidence put him at 2.31m, which at seven foot seven was still head, shoulders and much of the upper torso over most contemporaries. Byrne did not have access to a better diet than others around him. It was a gene mutation caused by a pituitary tumour that caused the growth. He died in 1783 aged just 22 though it wasn’t the tumour that killed him. Byrne lived 21 of those 22 years in Tyrone, born of unexceptional stock. Local gossips said the reason for his height was his parents’ love affair on top of a haystack and this lofty situation affected conception. Although acknowledged as a freak of nature, he wasn’t treated as one. As Australian historian Patrick O’Farrell noted, the Irish look at everyone on their merits. Writing about the Irish in Australia, O’Farrell noted they never paternalised their relationship with Aborigines because they never looked down on them as the WASPs did. Byrne moved to Piccadilly where he continued to work six days a week. Admittance for ladies and gentlemen was 2s. 6d, children and “servants in livery” paid a shilling. 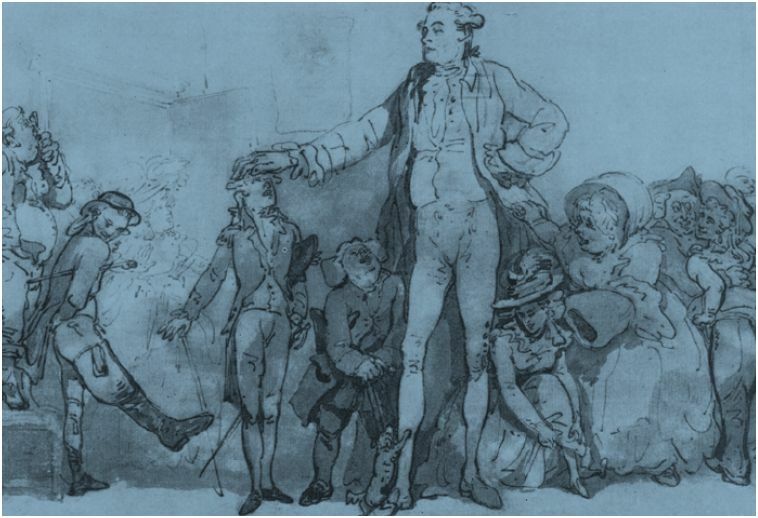 Vance and Byrne grew wealthy but by 1783 the public were tiring of the Irish Giant. His success drew other tall men to London including the Gigantic Twin Knipe brothers born only five miles away from Byrne in Tyrone. Another Irishman was advertised as a giant “upwards of Four Inches taller than the noted Burn.” Byrne’s problems were compounded by his love of gin and whiskey. He was frequently drunk on stage and many performances were cancelled. Vance dropped the price to a shilling but Byrne’s dissolution continued. On 23 April 1783 Byrne fell asleep in a “lunar ramble” at the Black Horse public house and someone stole £700 from his pockets – his entire savings. Devastated, he redoubled his drinking and contracted tuberculosis. He deteriorated badly and died on 1 June 1783. His biggest fear was not death but the surgeons’ thirst for his body. His Catholic upbringing gave him a horror of the coroner’s knife which he believed could deny his soul a place in heaven on Judgement Day. One man John Hunter, Surgeon Extraordinary to King George III, had no time for Byrne’s scruples. Hunter was a pivotal influence on modern surgery and dissected thousands of cadavers he got from “resurrection men” – professional grave robbers. Hunter coveted Byrne’s body for science. Byrne was aware of Hunter’s ambition and strove to thwart it in his dying days. His instructions were his coffin should be guarded by Irish friends who would bury him at sea. Byrne scraped the last of his savings to an undertaker to carry out the plan. Hunter was determined not to lose out. He employed a man named Howison to watch Byrne’s whereabouts at all times from a next door apartment. When Byrne died, a newspaper reported he wanted his bones “far out of the reach of the chirurgical fraternity”. One reportedly offered a ransom of 800 guineas to the undertakers. The offer was turned down but promoters got one last meal ticket out of Byrne as they displayed his enormous coffin for one shilling entry. On 6 June, the body was taken aboard a ship to Margate where it would be sunk in “20 fathoms of water” in the English Channel. Another boat was chartered and the coffin was tipped into the sea. But Byrne’s body was no longer in it. The Annual Register for 1873 said the sea burial report was “merely a tub thrown out to the whale.” When Byrne died, Howison immediately told his paymaster. Hunter bribed the undertaker for £500 who switched the body with paving stones while the funeral party was drunk. Hunter took the corpse to his surgery but became terrified of the revenge of Byrne’s friends if they found out. He chopped up the body and boiled the pieces so only the bones were left. In his haste, the skeleton was discoloured brown. Hunter’s failure to conduct an autopsy ruined any hope of diagnosing Byrne’s condition. He hid the huge skeleton for four years until Byrne’s name was forgotten. He displayed it in his anatomical collection and it was later displayed at the Hunterian Museum at the Royal College of Surgeons in London. In 1909 American neurosurgeon Harvey Cushing got permission to open Byrne’s skull and diagnosed the pituitary tumour. Byrne’s discoloured skeleton remains today in the Hunterian where many visitors including the current monarch have been fascinated by its extraordinary size. The tag line for the Durban Conference was “Climate Change in balanced fashion” leading to angry environmentalists’ response it was deeply unbalanced. They are spitting chips over the Durban agreement. We cannot afford no action until 2020, they said. The consequences to the planet of a “gaping 8 year hole” are potentially catastrophic, as the likely outcome is a further increase in carbon emissions in the short term. But environmentalists are showing their tendency to forget realpolitik: this latest deal is as good as the governments of the world were willing to give. This agreement is built on the small steps of Bali, Copenhagen and Cancun agreements to give a roadmap towards worldwide reductions in 2020. Sea level rises caused by warmer temperatures will continue long after the oven is turned down in 2020. There is also the prospect of mass extinction of species. Current best estimates have atmospheric carbon dioxide concentration exceeding 500 parts per million and global temperatures to rise by at least 2°C by 2050 to 2100. These values significantly exceed anything in the least the past 420,000 years during which most marine organisms evolved. Earth relies on the greenhouse effect to sustain life. CO2, methane and nitrous oxide all absorb infrared energy and keep heat energy on Earth and all are on the increase. The effects are varied: the North West Passage is becoming seaworthy again, the 3250 sq km Larsen B ice shelf disappeared in a month in 2002, glaciers in Argentina and Chile are melting at double the rate of 1975 while sea temperature rises are threatening coral reefs across the world. Even modest increases in sea levels could cause major flooding in many of the world’s low lying megalopolises. If there is a rise of 0.5m, the Majuro Atoll in the Pacific Marshall Islands would mostly disappear. If the sea level rises by 1m, one fifth of Bangladesh goes under as would 13 of the world’s 15 largest cities. If the unstable West Antarctic Ice Shelf replicated the behaviour of Larsen B sea levels could rise as much as 3m. If Greenland once again resembled its name it would add 7m to water levels. 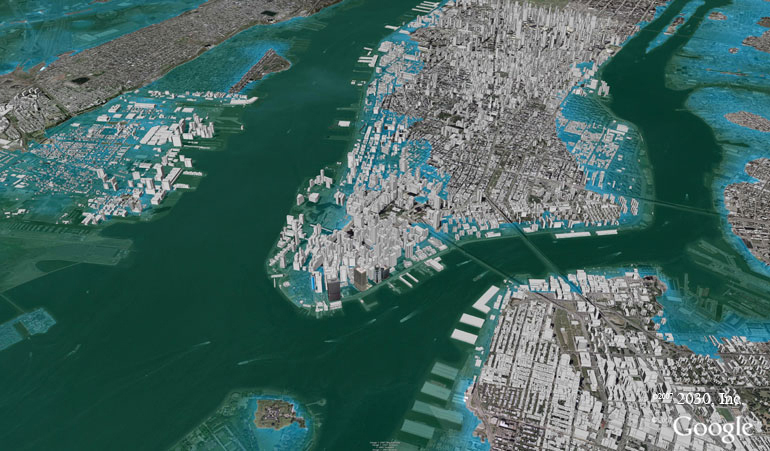 This picture is New York with a 5m rise, not beyond the bounds of possibility though the IPCC Fourth Assessment Report worst case scenario only allows for a maximum of 0.6m to 2100. The report also acknowledges global emissions will grow despite any mitigation measures. Even at the more likely levels of 0.3m by 2100, it is enough to obliterate many island nations. Without the power to influence except by emotion, their biggest challenge will be to preserve nationality without a territory. Believing a loss might be temporary has lawyers rushing to the Law of the Sea and the UN Convention to see how states could survive “in exile”. Despite the depression that starts this thinking, this is profoundly optimistic in the long term. It speaks to the unending human belief we can fix any problem, including ones caused by our own actions. The annual Climate Change Conference is like a large ship with a slow turning circle. But it is slowly taking effect. 1990 is used as the benchmark year for emissions as this the time science realised there was a major problem. It was also the year UN-steered climate change negotiations started. No-one cared at first. In the 5 years after 1990, carbon emissions worldwide increased from 1 billion tons to 7 billion tons. Twenty years later, the scientists still have difficulty selling their message. Yet recent International Energy Agency data shows global action is beginning to work. Countries who participated in the Kyoto Protocol were 15% below their 1990 levels two decades later. But Kyoto non binding countries led by China and the Middle East have greatly expanded their emissions in that time. The developing countries have a point in that historically the West has caused more emissions. But they have learned quickly from Western technology and China is now the world’s biggest emitter. An agreement of “annex” and “non annex” countries no longer makes sense despite the best arguments of India and China. This is why those countries ultimately signed the agreement. Let no one underestimate what was achieved in Durban this weekend. We have signed the first global deal that scales back our fossil fuel economy. 2020 is a long way away and there will be eight more meetings and eight more frenetic all-night negotiations as nations and economic blocs jostle for position in the brave new world of a post-carbon economy. It does not mean no action until 2020. The decision offers a clear signal the ship is turning. The markets will now promote investment in industries that best fit the new paradigm. If the Greens are impatient we are not turning fast enough, then rightwing groups such as the Australian Coalition are determined to steer straight ahead regardless. Abbott’s claim the carbon tax is an “international orphan” is wrong on three counts: Australia is not the only country to price carbon, it will be a necessary requirement to send the right market signals to move to renewables, and its overgenerous compensation means it will have little genuine effect on the fossil fuel industry in the short term. By 2020, the world will still be warming to dangerous levels. But an agreement is now in place and Australia has an enforcing mechanism. Whether that is too little too late is for our grandchildren to judge. The Queensland Government has approved the development scheme for the Surat Basin Rail Joint Venture. The approval is another tick for the proposed rail line linking the south-western line with the Moura Railway System. The Surat Basin Rail is the so called “southern missing link”, a 214km railway linking Wandoan and Banana. According to the Surat Bain Rail project, the railway will “enhance the existing coal rail network and unlock 6.3 billion tonnes of coal reserves in the Surat Basin.” The approval follows last year’s environmental approval and will connect to the future coal industry-owned Wiggins Island Coal Export Terminal. The Queensland Government’s Surat Basin Rail Bill 2011 proposes to grant a long-term lease over the Surat Basin rail corridor land. The bill has been referred to the Industry, Education, Training and Industrial Relations Committee for detailed consideration reporting back on 19 March 2012 (which may be after the next state election). The bill will regulate a lease the Government intends to grant to the SBR JV, to construct and operate the railway. The Bill would provide exemptions from provisions of the Property Law Act 1974 and the Land Title Act 1994. The Co-ordinator General’s report said the project’s value would increase once integrated with other rail and port infrastructure projects. The Co-ordinator General has imposed environmental conditions relating to land and soil, water management, air quality, traffic, greenhouse gas emissions and other factors. He accepted impact on good quality land was unavoidable and further investigations were required for future habitat approvals. 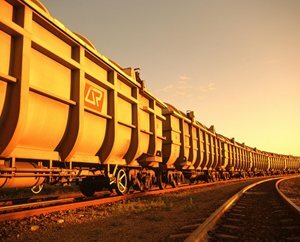 The Surat Basin Rail Joint Venture has an exclusive mandate from the Queensland Government to develop the project as an open access coal and freight railway. Government approval allows the joint venture to begin land acquisition and construction in late 2012 with first coal on rail due in 2015. The railway will have the capacity to transport 42 million tonnes of coal per year on trains 2.5 kilometres in length. Stanmore Coal made the development approval announcement in an ASX release last week. Stanmore has a vested interest having applied for five million tonnes of capacity on the SBR to deliver 5Mtpa of high quality export thermal coal from The Range project from 2015. The Range project is in the north of the Surat Basin 27 km south east of the line. Stanmore Coal has obtained 7Mtpa of priority capacity rights at the proposed Wiggins Island Coal Export Coal Terminal Stage 2 at Gladstone. Wiggins Island is expected to open in 2014. The 27Mta coal terminal is located at Golding Point, Gladstone. It is owned by eight coal producers and will be operated by the Gladstone Ports Corporation. The terminal will be built in stages and when fully commissioned will provide more than 80Mtpa in export coal capacity. Stage 1 construction of the $2.5b project started in October. Construction will include a stockyard for 1.9Mt of coal, a 5.5km-long overland conveyor, a 7600tph rail receipt facility, a single berth with travelling ship loader and channels and wharf to accept 40,000-220,000dwt ships. A feasibility study for the terminal’s expansion is expected by the end of the year. Coal remains central to Queensland’s economy. The Pearl Harbor survivors association has used the 70th anniversary to announce they will disband at the end of the year. An estimated 8,000 people who survived the Japanese attack on Hawaii are still alive and 2,700 are members of the association. But it has become too difficult to organise the annual national reunion in Honolulu. Association President William Muehleib cited the age and poor health of remaining members. “It was time. Some of the requirements became a burden,” Muehleib said after this year’s ceremony at Pearl Harbor. The moment of silence at the ceremony was marked just before 8am when the first Japanese planes launched their attack. Tuesday, 7 December 1941 would live in infamy” as Roosevelt predicted. In two hours, 2,400 people were killed, 1,200 wounded (a shocking discrepancy between the dead and wounded), 20 ships sunk and 164 planes destroyed. The infamy FDR spoke about was not the death toll but the fact the Japanese had lied to the US Government and attacked 30 minutes before they declared war. The cause of Pearl Harbor, as so much of the 20th century’s conflict was oil. Expansionist Japan was reliant on US petroleum to fire its economy but knew the time would come when America would turn off the tap. The US took a dim view of the 1931 Japanese invasion of Manchuria and the subsequent war with China. From their puppet base in Manchukuo, Japan declared all out war on China in 1937. Relations with the US deteriorated with the USS Panay Incident in 1937 when the Japanese sunk an American ship in Nangking and then the Allison Incident where US consul to Nangking John Moore Allison was struck in the face by a Japanese soldier. 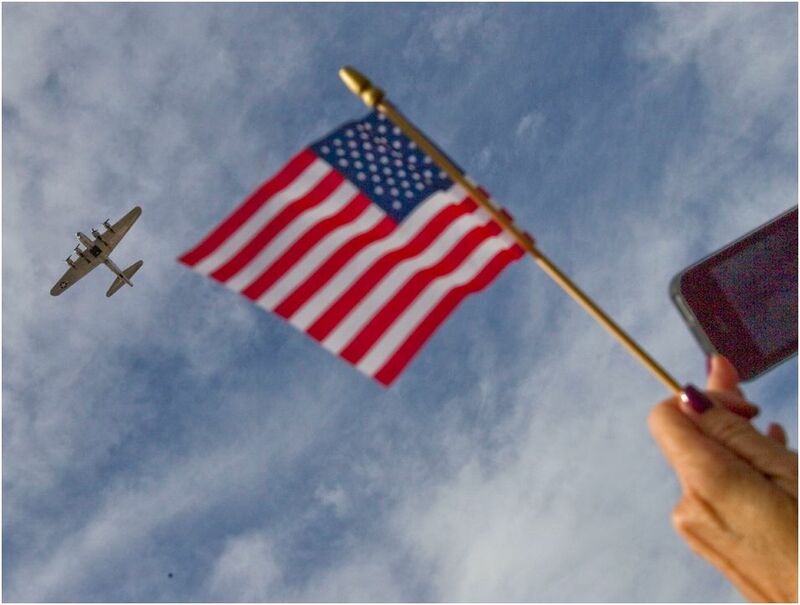 Japan said sorry for both incidents claiming it did not see the American flags on the Panay. It did not offer an excuse for Allison but bowed to US demands for an apology.Economic self-interest ensured the US supplied oil to Japan until 1941. In July that year they finally placed an embargo as did Britain. So did the Dutch two months later, breaking a treaty with Japan and ending the supply line of Javanese oil which had supplied 15% of Japanese crude. The embargo put a critical constraint on the war in China. Japan was the sixth largest importer of oil in the world. If Japan wanted to resume bombing Chiang Kai-Shek and Mao Zedong’s armies, it would have to grab oil for itself and the East Indies was the easiest target. While Pearl Harbor was a shock, the war between US and Japan was no great surprise. A majority of Americans expected war in Asia especially in the Philippines which held many strategic American interests. Japan knew it could not cope with planned American expansion of the Navy. The 1940 Two-Ocean Navy Act (sponsored by two Democrats Carl Vinson of Georgia and David Walsh of Massachusetts) planned to expand the size of the US Navy by 70%. Japan struck a blow before the Vinson-Walsh ships came off the assembly line. An attack on Pearl Harbor, the Japanese believed, would also neutralise the Pacific Fleet to give Japan free reign to take Jakarta. Then the Americans would sue for a peace profitable to Japan. That this was flawed thinking is obvious in retrospect as was their failure to work out how the US would respond. Yet it was no woollier than the thinking that led to another oil war. The 1941 attack was led underwater. Five midget submarines came within 20km of the coast and launched their charges at 1am. At least four were sunk. Then the planes struck. There were almost 200 in the first group. A second wave of 170 flew closely behind. They were picked up by newly established radar on the northern tip of Oahu but were misdiagnosed as a returning US crew and its size was not passed on to headquarters. At 7.48am they arrived at Pearl Harbor. The immediate target of the first wave was the battleships. Japan believed the battleships were the biggest status symbols of the Navy but badly misread their importance. The sinking of one battleship the USS Arizona caused half the death toll on the day. Ten torpedo bombers attacked the ship. After one bomb detonated in the Arizona’s ammunition magazine, she went up in a deafening explosion. 1,117 of the 1,400 crew were killed instantly and the fire took two days to put out. The second wave targetted hangars, aircraft, carriers and cruisers. After 90 devastating minutes, half the planes on Oahu were destroyed. A planned third wave to knock out Pearl Harbor’s remaining infrastructure was called off which Admiral Chester Nimitz admitted could have postponed US operations for another year. Japanese Admiral Chuichi Nagumo refused because of likely casualties and a need for night-time operations. Hong Kong was attacked a day later as were US territories Guam and Wake Island. The Philippines, a commonwealth of the US at the time, was also invaded on 8 December. The same day Japanese troops made an amphibious landing at Kota Bharu in north-eastern Malaya, and six points along south-east Thailand, an invasion ended by an armistice which allowed Japan to use Thailand as a base to attack Malaya. Malaya had rubber and was the obvious dropping off point to access East Indies oil. Only the US, Iran and Romania exported more oil than the East Indies but the profits went to Royal Dutch Shell. Borneo was another victim of the 8 December attacks threatening the oilfields of Kalimantan. The rest of the island archipelago quickly fell and would remain in Japanese hands until 1945. The three aircraft carriers at Pearl Harbor base were out at sea during the attack and the elimination of its battleships gave the US no choice but to put the fate of the war in its carriers. While the Europe First policy slowed down the Pacific conflict it was almost over as soon as it began. A wrathful America armed with its new Navy and massive fighting capacity never forgave Japan’s treachery. By July 1942, America sunk four of Japan’s carriers at Midway. Japan used Indonesian oil, fierce military pride, a deadly code of honour and incessant pro-war propaganda to keep the insanity going for another three years. Prominent blogger Razan Ghazzawi is the latest victim of an increasingly desperate Syrian regime, detained on her way to a media conference in Jordan on Sunday. The US-born human rights activist was arrested at the border while on her way to attend a workshop in Amman for advocates of press freedoms in the Arab world. While the Assad administration have said nothing, a local committee of activists confirmed the arrest yesterday. The Syrian Centre for Media and Freedom of Expression (SCM) said Ghazzawi was their media officer and attending the workshop for them. 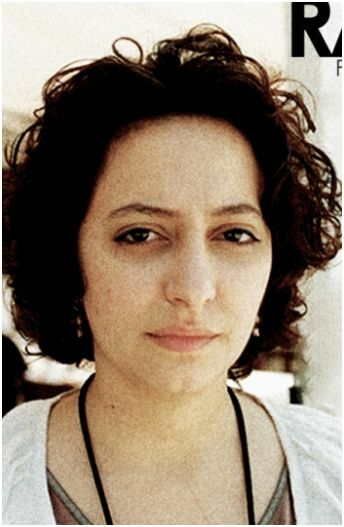 SCM condemned her arrest and the restrictions on civil society and freedom of expression in Syria. “SCM demands authorities stop abuse of systematic practice against bloggers, journalists, and Syrians citizens,” they said. “SCM demands to release the blogger Razan Ghazzawi immediately and unconditionally and to release all detainees in Syria and stresses on the need for Syrian authorities to respect their international commitments that have committed themselves to it through the ratification of the conventions and treaties international.” SCM said they held Syrian authorities responsible for any physical or psychological harm caused to her.Ghazzawi has been a high profile documenter of violations and arrests in Syria since the start of the uprising in March. Bravely she was one of the few in Syria to blog under her real name. Her most recent post on 1 December announced another Syrian blogger and activist Hussein Ghrer had been freed after 37 days in Adra prison. “Hussein is going to be home tonight, where he will be holding his wife tight, and never let go of his two precious sons again,” Ghazzawi wrote. “It’s all going to be alright, and it will all be over very soon.” The nightmare has begun for Ghazzawi herself. A message on Ghazzawi’s blog shows what she told friends before she set off for Jordan. If anything happens to me, she said, “know that the regime does not fear those imprisoned but those who do not forget them”. She knew was taken a great risk by travelling to the conference. The blog MidEast Youth is making much of her US citizenship in its calls for her freedom. While Ghazzawi admits she born in the US she never lived there. Her family lived for 10 years in Jeddah in Saudi Arabia and are now back in Damascus. She graduated with a degree in English literature from Damascus University and did a further five years of study in Lebanon before returning home. The administration shows no sign of bending to intense international pressure either to release her or end atrocities against protesters. Instead Syria held war manoeuvres over the weekend. State-run television said the exercise was meant to test “the capabilities and the readiness of missile systems to respond to any possible aggression.” The drill showed Syrian missiles and troops “ready to defend the nation and deter anyone who dares to endanger its security”. Assad and his regime intend to tough this out with the support of Russia and China and won’t mind the collateral damage to the likes of Ghazzawi in the process.